MOS Mexico 2017: A Performance of Graffiti’s Multiplicity – Caitlin Frances Bruce, PhD. “MOS Mexico: The most important graffiti event in the Americas” the Meeting of Styles Mexico website boldly states. Perhaps there is some truth to the statement insofar as the event attracts participants from across the globe, with representation from Western and Northern Europe, North America, Central America, and South America. But important for whom? The artists? Graffiti communities? Street art communities? The sponsors? The residents of the cities in which the events are held? The answers to these questions vary depending on the iteration of the festival and the claim about importance offers a clue to the shifting coordinates of the event since its founding in Mexico in the early 2000s: the organizers of this series of events are deliberately and carefully building a framework for festival production that straddles multiple spheres: the touristic, the community driven, the urban, the peri-urban, proximate to institutions of state power and at a distance. Inhabiting multiple and seemingly conflicting realms is something that graffiti is uniquely situated to accomplish, Kraidy has argued, claiming that graffiti’s function is heterotopic, always a little apart from but also deeply reflective of dominant cultural tendencies. In this piece I reflect on my experience at MOS Mexico in two of the three sites: Tlajomulco de Zuñiga, Jalisco, and Playa del Carmen, Quintana Roo, to map the various topoi that the festival travels, conceptually and materially. MOS Playa del Carmen. Machine fish. October 22, 2017. Photo by Caitlin Bruce. As I’ve written in other posts, MOS Mexico changed leadership in 2013, and also changed location from Ciudad Nezahualcoyótl, Estado de México, to the Centro Historico, and also expanded from one annual festival to three within the month of October. I discuss some of the tensions and possibilities in this shift in my forthcoming book. This year, the festival was sited in Tlajomulco de Zuñiga, Jalisco; the Centro Histórico of Mexico City; and Playa del Carmen, Quintana Roo. The movement from Tlajomulco to Playa del Carmen can be described as a migration from the peri-urban to the deeply touristic, the local neighborhood to the global Disneyland beach-side town crafted in an image so general and so stylized that it leaves little room for surprise. I traveled to Tlajomulco with Orion and Brote from León. They, along with Bote, were representatives for León at MOS. To get there in time to take the bus from Tlajomulco to the site we left León at about 2am, taking a bus to Guadalajara, and then an uber through pouring rain to Tlajomulco. The trip was surreal, and the men slept little, chatting about what pieces they would paint, what colors they hoped to have, what MOS is like, and so forth. Tlajomulco is about thirty minutes outside of Guadalajara, one of the “most graffitied” cities in Mexico. There were only two hotels in the small city center, both called Plaza Hotel Tjaljomulco, though only one in the plaza. The non-plaza version which was decorated in a vaguely Las Vegas/1970s style sheen was completely full with the visiting writers. At about 10am everyone gathered in the hotel lobby, filling it to the brim, spilling out into the streets where writers smoked cigarettes, greeted each other, ate breakfast or simply sat quietly, some, perhaps, nursing exhaustion from the travel or a hangover. We were waiting for a bus to take us to the paint site. I heard mostly Spanish being spoken but also some French, and recognized a group from previous trips to MOS France in Perpignan: Revs and Berns, from Paris, and two crewmates from Toulouse. Berns has had an interesting trajectory: born in Peru he located to New Zealand for a number of years, and now has been living in Paris for five. He and Revs are energetic and often the group clowns, cracking jokes, shuttling between French, Spanish, and English at lightening speed. They tease me for my rusty and broken French, and we shift back into Spanish to complete a greeting where I explain how I know of them and their work. When the bus arrives the MOS staff wearing t-shirts and caps that say “X” on the front and “Mixer” on the back, load posters, banners, and paint into the belly of the bus. Berns. ODV Crew. MOS Tlajomulco de Zuñiga, October 8, 2017. Photo by Caitlin Bruce. I end up sitting next to one of the organizing crew, X83 from Mexico City. He notes of the location that it is an attempt to “decentralize the festival” since the subsequent iteration (in a week) will be in the country’s capital. The last one, he notes, “will be in a touristic site.” The decision to locate to Tlajomulco was not random: Mixer did an art intervention with the government of Jalisco earlier and so had the ability to do a presentation hwere they summarized what they had already done, and what they planned to accomplish. On the forty minute bus ride to the side I noticed that for the size of the town there were a number of urban art interventions. Murals decorated some of the larger buildings, and entryways to fraccionamientos had painted blocks or cartoon-like figures of dolls, birds, etc. MOS Tlajomulco de Zuñiga site. October 7, 2017. Photo by Caitlin Bruce. 360 Paint camper. October 7, 2017. MOS Mexico Tlajomulco de Zuñiga. Photo by Caitlin Bruce. At about 11am we arrived. The site was a large boulevard that started with a parklet on either side, triangles with some grass and a few trees breaking up long concrete walls and pavement streets. Across the street from where we descended from the bus was a large camping vehicle painted “360 Paint” in 3-d on one side, and a large monster on the other side. The walls of the boulevard were primed blue for about a kilometer on either side with numbered spaces. The MOS staff unloaded small duffel bags with the 360 logo into a large pyramidal pile. They set up banners and standing posters with the festival logo and sponsors on it, and at a folding table piled high with sandwiches, apples, and jugs of horchatafour women stood behind and handed out breakfasts. We were encouraged to get in line and grab food, and for about twenty minutes people ate, quietly chatting, looking around the site. I noticed more familiar faces from the MOS 2011 and 2014 festival: Reak, one of the co-owners of 360 paint was there. He explained that the factory had moved after a robbery (it used to be near Neza) and now was in Queretaro. We reminisced about our first meeting where I hung out with the 1810 mob (a crew that has members in Mexico and Los Angeles) and he told me that he had been able to visit the guys in California, painting with Skul and Arte. Laying outlines. October 7, Tlajomulco de Zuñiga. MOS Mexico. Photo by Caitlin Bruce. As I sat alone drinking horchata and observing two kids approached me. They looked to be about nine or ten. They had many questions, asking where I was from, if I was an artist, if they could paint too. I tried to explain that the artists were selected in advance, but that they probably could ask the artists questions about how they paint, if they wished since it was a public event. I asked them if they were from Tlajomulco, and what they liked the most about their town. “The green spaces,” a stockier boy said. I would see them again throughout the day, and the next, as they fearlessly walked around the event, asking the artists for autographs and commentary. By about 11:30 a crowd gathered around the main tent. Gerso, the lead organizer was giving an opening address. After thanking the sponsors, and introducing local contacts from the municipality of Tlajomulco, who offered to provide advice and help, he said: “This is the opening event for MOS, and this location is an important element of our goal to decentralize the festival. We are in a residential neighborhood here, and so let us be very respectful to these people, our neighbors. Now, listen up, I am going to announce each person by your name. you will pick up your credential (artist’s badge), a t shirt, and your paint kit. You will be assigned a number, and that corresponds to your place on the wall.” He explained what range of numbers correspond to what part of the wall. “There is a chavo who cannot attend, and this would have been his first MOS. His father died. So, it would be nice, if you wanted to put his name up. His name is EMES,. E-M-E-S.” Gerso went through the roll call, “I will not repeat names, guys,” he warned. The little kids I’d talked to earlier approached the table and asked for tshirts. “No,” Gerso’s girlfriend seemed to say. They still stuck close. I accompanied Brote and Orion to their spots, which were close to each other. “This is plenty of space!” they noted approvingly. Little vertical slashes marked boundaries between spots. There was little shade (maybe three of 90 or so spots had trees) which meant that the sun was brutal, but that visibility was good of the pieces from the street. Bote was situated in the parklet, closer to shade, the port-o-potties and the tents where meals were served and where the MOS staff congregated. I had interviewed Bote years ago when I first went to León. His style is still letter-based, simple, but very clean and balanced. He was painting next to a guy from Morelia/Monterrey, Anes, who had more lyrical letters, not quite wildstyle but not quite readable. Anes painting. MOS Mexico Tlajomulco de Zuñiga. October 8, 2017. Photo by Caitlin Bruce. The range of mediums at the festival. In addition to more traditional aerosol based works artists worked with brush and acrylic paint, as well as stencils, and there was relative balance between those who did image-based work, and those who focused on text. One man who wielded a rudimentary stencil that included holes for eyes, mouth, and lots of little holes punched to create the details of a face wrote 90Once4, and wore a t-shirt reading “Galeria Arte Urbano Tlajomulco,” providing a clue into the history of the site as one that has repeated hosted urban art events. This was one of many indications about the spread of “arte urbano” and youth institute programming across the Mexican republic that I would encounter throughout my travels in October. Two men working with large stencils of women holding spraycans were from Queretaro and named Reybel and Himed. In an interview they noted of their experience at Tlajomulco that it was unique because of the number of kids who visited them and asked questions and for autographs. Their final piece used the stencils to create two women back to back arms outstretched with aerosol cans, and the arms are tripled, indicating motion. In an interview Berns, too, noted how remarkable it was that such a large number of youth came up and asked questions and for autographs. “Its really cool that they want to learn more about graffiti,” he reflected. 90Once4. Textures. October 8, 2017. MOS Mexico Tlajomulco de Zuñiga. Photo by Caitlin Bruce. Chileno artist. October 8, 2017. MOS Mexico Tlajomulco de Zuñiga. Photo by Caitlin Bruce. Los Calladitos. October 7-8, 2017. MOS Mexico Tlajomulco de Zuñiga. Photo by Caitlin Bruce. Octopus by Pepe from Chile. October 8, 2017. Photo by Caitlin Bruce. Snap from Monterrey. October 8, 2017. MOS Mexico Tlajomulco de Zuñiga. Photo by Caitlin Bruce. Another team of street artists was Ari and Jorge, who collectively make up the group called Los Calladitos from San Miguel de Allende. Their mural of a large floating man with a bright white light and a hole in his heart with little angels around him is the second part of a series they are working on which will ultimately be part of a stop motion film about characters made up of light called “dons.” Painting next to two Chileno artists, they had brought their baby kitten, a tiny orange thing that alternately cuddled with one of the Chileno’s partners, or curled up in a blanket in a cardboard box. The cat was not the only pet, a man painting a detailed half-mechanical half-animal crocodile with paint and brush had a little white and brown spotted dog which snuggled close to the wall under a chair next to speakers that gently played music. Mechanical/musical alligator. MOS Mexico Tlajomulco de Zuñiga. October 7, 2017. Photo by Caitlin Bruce. Other more traditional graffiti artists included Smar, from Mexico City, who did elegant gothic letters, Reak who did 3-d mechanical letters, and Beste, one of the Mexican women writers who has been writing the longest. Storm, a Danish writer, had abstract geometric lietters. Realist graffiti works included a scene of two dueling dragons, or faces of women. Dragon outlines.MOS Mexico Tlajomulco de Zuñiga, October 7. Photo by Caitlin Bruce. Dueling dragons. MOS Mexico Tlajomulco de Zuñiga, October 7. Photo by Caitlin Bruce. Reak. MOS Mexico Tlajomulco de Zuñiga, October 7. Photo by Caitlin Bruce. Orion. MOS Mexico Tlajomulco de Zuñiga, October 8. Photo by Caitlin Bruce. Smar. MOS Mexico Tlajomulco de Zuñiga, October 8. Photo by Caitlin Bruce. 3d styles. MOS Mexico Tlajomulco de Zuñiga, October 7. Photo by Caitlin Bruce. Self-representation. MOS Mexico Tlajomulco de Zuñiga, October 7. Photo by Caitlin Bruce. Trump/Kim Jong Un. MOS Mexico Tlajomulco de Zuñiga, October 8. Photo by Caitlin Bruce. Women’s faces and jellyfish.MOS Mexico Tlajomulco de Zuñiga, October 8. Photo by Caitlin Bruce. By 1 pm most outlines had been applied and the staff started to give out posters to passers by. Large packs of youth and families began to circulate up and down the walls collecting signatures from participating artists. About ten people every 30-40 minutes would ask each artist for their autograph on the poster. Los calladitos and fans. October 7, 2017. MOS Mexico, Tlajomulco de Zuñiga. Photo by Caitlin Bruce. 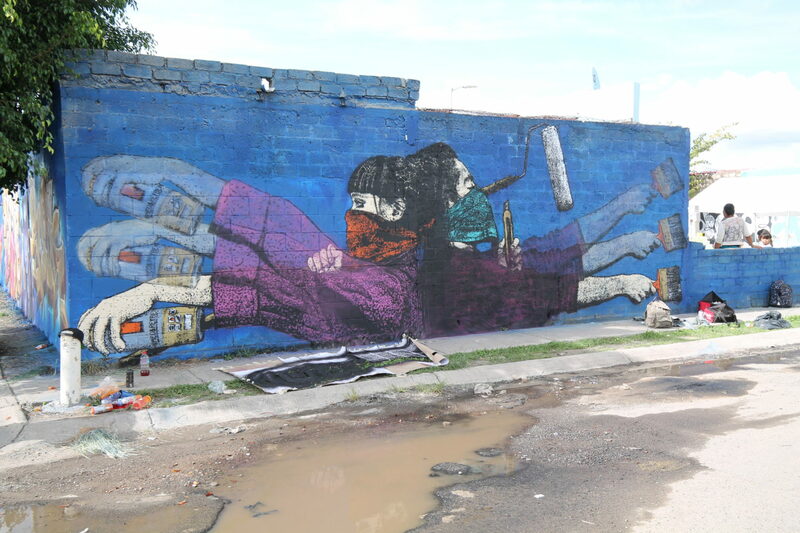 I learned that the women giving out food worked for the Tlajomulco youth institute, and the institute had sponsored the creation of a street art gallery called Trazo and graffiti workshops, as well as BMX dance and other kinds of workshops. They organized the lunch as well, which was a wide range of different guisados for tacos, with several kinds of salsa and agua de Jamaica. Feeding the artists was important, Gerso mentioned in an earlier interview, they need lodging, transit, food, and supplies to be able to focus on their work and do the best job and have the best experience. At lunch I met a young Guadalajara writer named REM who said, with pride that Chaz Bojorquez (a famous Los Angeles writer who pioneered a calligraphic style of writing based on cholo placas) had lived in Guadalajara, and that it is “the most graffieid city in the world.” He expressed simultaneous frustration about MOS for being “elitist” but also his longing to participate. Lunch time. October 7, 2017. Photo by Caitlin Bruce. There were a number of police watching the event. What was notable were the numbers of seemingly low-intensity interactions between police and writers: eating near each other, police taking selfies with the works, or asking questions of writers about process and technique. On the second day when we wait for the bus the mood is more relaxed: participants have had the time to share meals and space, and perhaps having made good progress on their work there is less anticipation or anxiety. Some writers shyly ask the others for autographs. Again, breakfast is there when we arrive, and the Youth Institute women tell me to eat, that “it’s just frijoles y queso, no carne.” I am embarrassed and touched that they remember that I am vegetarian from a passing comment. While I ate lunch, I was approached by another group of youth, four boys, about eight years old. One of the youth institute staff told them I was from the U.S. They asked me, point blank: “Do all Americans things Mexicans are bad?” I tried to explain that Trump was not representative of everyone’s opinion, and that those who are hateful are ignorant. In the same breath they asked about how much and how long it takes to get to Disneyland, to do the math of dollars into pesos, where I had traveled, and where my husband was (the assumption being that I had one). This little exchange pointed to the festival as a site for international contact, for youth, and writers, to negotiate with stereotypes and preconceptions. Though it was not as much of a party as perhaps MOS France is, with live dance and music and beer and wine for sale, it was a vibrant site for exchange and learning about youth who live beyond big cities, but still have pressing questions and curiosity about the world beyond, but also pride and interest in sharing their own perceptions and experiences. Brote, Orion and I left around 4pm: they had work the next day and were eager to get back to León, and I, too, was eager for a bit of rest before the next trip. Moreover, for many of us, Tlajomulco was just the first of a set of reunions across the country. MOS Playa del Carmen.October 22, 2017. Photo by Caitlin Bruce. “Meeting of Styles.” Manuel, MOS Founder, MOS Playa del Carmen. October 22, 2017. Photo by Caitlin Bruce. Playa del Carmen is like a giant strip/playground/fantasy relam for massages, drinks, ice cream, and souvenirs. People are only partly dressed, many covered in sand, walking with weaving, slow and intermittent steps. The rhythms of vacation and service industry. Merchants yell about their wares and target particular passers by: “Señorita! Lady! Guerita!” in the humidity the thought is also slowed and one can think only of appetitive things: heat, thirst, hunger. Crepes. The warm ocean water. There is a much smaller group for this iteration of MOS. It is around a secundaria (middle school) about three or four blocks west from Quinta Avenida, the main tourist drag. The walls were primed a dark purple again with numbers and little slash marks designating spots. At about 10:20 writers approached the spot from the hostel where they were collectively housed, and Gerso waved the group around a corner where a large van was parked, MOS staff seated inside and standing around it. He coughed, laughed and said “This is the Meeting of Styles…blah blah blah,” to laughter since most of the people present had participated in the prior two festivals. There seemed to be a significant decrease in urgency and also more informality because unlike DF or Jalisco it seemed like the audience was only writers and family/friends, not politicians and media, as well. As in Jalisco, Gerso read the name of the writer, their spot number, and they went to get their paint, tshirt, and credential (a lanyard with a cardboard decal with “MOS” on one side and “Artist” on the other). This time Zhot and Brote were the represenatives for León. They painted next to each other and in between a Berlin writer, Riots, and another writer with an equally chaotic style. It was curious to see the graffiti walls adjacent to the palatial vacation homes and hotels surrounding the school. We were by another ADO (bus) station so many would see the works on their way out of the city, and drivers would slow the buses to watch the writers in action. Brote. MOS Playa del Carmen. October 22, 2017. Photo by Caitlin Bruce. Brote, detail. MOS Playa del Carmen. October 22, 2017. Photo by Caitlin Bruce. Zhot in process. MOS Playa del Carmen. October 22, 2017. Photo by Caitlin Bruce. “Stay wild.” MOS Playa del Carmen. October 21, 2017. Photo by Caitlin Bruce. Storm from Copenhagen. October 21, 2017. MOS Playa del Carmen. Photo by Caitlin Bruce. I met one of the organizers, Secreto Rebollo from Guadalajara, and interviewed him about the MOS Mexico festival. He explained that one of the key groups, Mixer, grew out of frustration that many graffiti events were not artist-run and were not organized with the experience of artists in mind. A year ago Mixer was founded, a collection of aritsts from across the Mexican republic. Alter Nos from Mexico City is also part of Mixer, and has participated in legal graffiti programs in Mexico City since the early 2000s. His whole family came with him to MOS, and all but his son paint, using the practice to bring them closer. Alternos. MOS Playa del Carmen. October 22, 2017. Photo by Caitlin Bruce. I also met Franc Mun, a Chilango writer who does largely image-based work. For MOS Playa del Carmen he was painting a fish and a fish skeleton. Franc Mun. MOS Playa del Carmen. October 22, 2017. Photo by Caitlin Bruce. Around the corner was Nove Noël from Galicia, who discussed how he strives, in his work, to make commentary specific to the site, a particular challenge in the context of events like MOS where one has little understanding or relationship to community. He ultimately did a big burner with his name and a confused and anxious looking octopus with the thought bubble: “Carmen?…” because “it is all foreigners here, hard to find actual Mexicans,” a playful commentary on the no-place of tourist sites. Deas. MOS Playa del Carmen. October 22, 2017. Photo by Caitlin Bruce. The second day, in an abandoned lifeguard hut by a construction wall where some of the guys did some quick pieces on the beach, I interviewed Riot from Berlin, who also finds MOS to be a key site for building connections globally. His work is humorous, chaotic, and visually dense. MOS Playa del Carmen. October 21, 2017. Photo by Caitlin Bruce. I also met Flit, from Yucatan, a 360 sponsored wall with prehispanic themes. For him, festivals in Merida played a key role in his artistic development. Collaborative 360 wall by Yucatan writers. MOS Playa del Carmen, October 22, 2017. Photo by Caitlin Bruce. MOS Playa del Carmen, October 22, 2017. Photo by Caitlin Bruce. Also visible at the festival are boutique graffiti economies. A group from Queretaro sold paint and pens out of the back of their car, another group sold t-shirt’s by their friend’s wall. Shady from Chiapas. MOS Playa del Carmen, October 22, 2017. Photo by Caitlin Bruce. At Playa del Carmen, interaction with residents is minimal. Though some tourists would stop to take photos or even chat, or some of the local performers would provide commentary on the pieces as they changed into Aztec warrior costumes, the writers were able to paint with minimal distractions from humans. It was a much smaller group than in Jalisco, and most finished their pieces rapidly, perhaps because of the challenging weather (there was lots of rain), or because of the desire to turistearby the beach. Looking at the two festivals provides a sense of the potential range of audiences and spaces that can be engaged by these events particularly due to the high level of organizational acumen brought by the planning team, but also some limitations that the structure provides (limited knowledge of place, exhaustion from travel, distraction from site). For me, it provided a wider panorama of the growth of legal graffiti practices across Mexico over the course of the past twenty years.